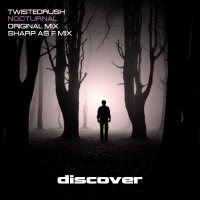 TwistedRush return to Discover with two mixes of their stunning new tune Nocturnal. The Original Mix is an epic off beat journey with bags of melody, gated chords and a haunting topline that takes the tune through the gears on the build to the breakdown. The breakdown itself is pure sonic magic with hooklines and counter melodies that wrap you in sonic cotton wool before an acidic stab cuts through with precision to lift Nocturnal yet further into orbit. The Sharp As F edit strips everything back for those moments when less is more. 'Nocturnal' is available now from Beatport and iTunes.